I was much more interested in what would happen post debate. Both the Trump campaign and the Clinton campaign had interesting approaches to getting the word out about their respective VPs in the hours after the debate was over. Many pundits talked about Pence’s cool and calm demeanor in the debate compared to Kaine. 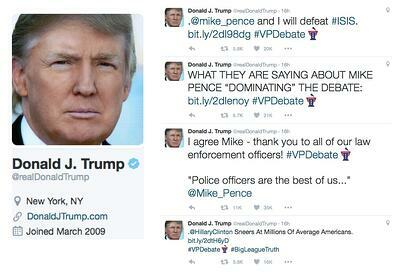 Not surprisingly, Donald Trump took to Twitter before the debate was even over to offer his real-time reactions to the Pence and Kaine show. He then talked up Pence’s debate skills at his rallies yesterday. As I have said many times since Trump entered the race, he has relied on his Twitter feed to influence the media. It’s what won him the Republican nomination. But his campaign’s two primary strategies - concentrating on large rallies to feed soundbites to the press and using Twitter to feed wordbites to the press - will not be enough to secure victory in the election which is just a month away. To win, Trump needed an integrated marketing plan. He doesn’t appear to be investing in a ground game of local grassroots politics nor an approach to create content from his offline efforts. 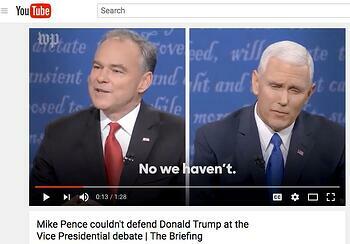 On the other hand, even though Kaine was said by many to “lose” the debate, the Clinton campaign quickly created a video culled from debate footage, which was published just a few hours after the debate was over. Direct link to Mike Pence couldn't defend Donald Trump at the Vice Presidential debate | The Briefing on YouTube. The video shows how Pence’s answers to some of the questions and his reactions to Kaine’s interruptions didn’t agree with many of the things he and Trump have said on the campaign trail. Looking at the debate in hindsight, it appears that Kaine was prepared to use the debate to create these video nuggets. His strategy may have been to push Pence into saying things that could be used against the Trump-Pence ticket. So even though he was widely said to have "lost" on debate night, this video can be repaeated again and again and again until election day as a television advertisement. For that reason, in the long run he "won" the debate. This quick and clever use of video footage highlights the Clinton campaign's expertise in waging battle on multiple fronts. It’s what will likely mean the difference in the election. Trump was able to win the Republican nomination using a real-time marketing strategy to earn free media. That worked great when he was battling nearly 20 other candidates. However that strategy alone won’t be enough to win the general election against just one other viable candidate. I’ve been a cheerleader for the ideas of real-time marketing and newsjacking for many years now. During that time, many of you have pushed back to show me that this strategy alone is not enough to market a product or service or organization. Thank you for that(!). This election cycle has been an amazing case study in marketing strategy. While we don’t quite yet know the winner, I’ve certainly learned a great deal. Real-Time may have won Trump the primary but it doesn't appear to be enough in the general. What can you take away from all this? For example, how can you take an offline event (like the VP Debate) and use that as fodder for your online marketing ot Twitter feeds (like the Clinton and Trump campaigns have done)? Can you make a video of your CEO’s speech and use clips to reach buyers online? Can you take something interesting happening with customers or at your event or retail establishment and bring your offline success to the online world? Important note: This is a marketing blog, not a political blog. I am not commenting on any candidate’s views on the issues nor am I publicly supporting any candidate. I write about the US Presidential election because it is a massive marketing case study playing out for several years, not because I voice my support for any candidate over another. For more of my posts about US Presidential election marketing going back three election cycles, go here.